The Ottawa Titans Water Polo Association is a not-for-profit organization that has been serving the Ottawa community since 1984, offering recreational and competitive water polo opportunities to players from 5 to 55+ years old. They are one of the largest and most successful water polo clubs in Canada. In the past five years, the Titans have ranked amongst the top 5 water polo clubs in the country and have produced a number of athletes who proudly represent Canada at the international level. This tremendous success at the competitive level can only be sustained thanks to one of the most comprehensive set of recreational water polo programs in the country. The Titans are THE place to be for any water polo enthusiast. 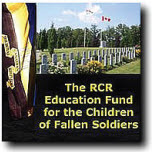 Since the event started in 2013 over $15,000 was raised in donations, and split between the CHEO Foundation and the Royal Canadian Regiment's Children of Fallen Soldiers Educational Fund.